(Cucumis melo var. 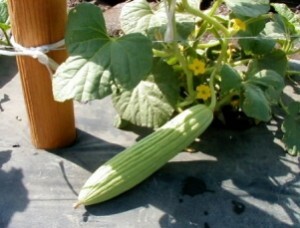 flexuosus) Also known by several other names such as Armenian cucumber, kakri, snake cucumber and snake melon. In Punjabi it is known as Tar. Plant directly outdoors in its permanent location. Thin to 18 in. apart. Train onto a trellis or fence for best results. Do not let mature fruit stay on the vine. Approx 45 seeds/pkt.